Description: 4 of the 49's massive drivers and valve gear. Description: OPR 1202 at Union Station on Natl. Train Day with 4449 and 7400 right behind it (not visible in this photo). Title: You smell the paint? Description: Im the first person to upload this brand new GEVO on the site here, and Im pretty sure I've never seen something this clean in my life! Description: Note the 5 buffer cars. there were 120 intermodal cans on flat cars with Explosive 2.1 placards and alot of DODX flats.......I know whats in here, you make your own assumptions. Description: A westbound train of containers marked "explosive" on mostly DODX flats rolls across the Staples Sub between Clear Lake and St Cloud. Description: A westbound explosives train with a CSX unit in the consist rolls around the curves through Frazee. Description: 4449 & 7400 parked side by side at Union Station on Natl. Train day, with the 1202 in front of them (not visible in this photo). Title: BNSF's Stockton-Provo "Q" Train. 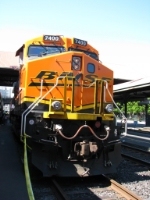 Description: BNSF's Q-STPV-J performs switching chores before finally shoving it's train into the Provo Yard. Mount Timpanogos stands guard in the distance. Description: Another view from my previous image of BNSF's Stockton-Provo ''Q''Train is looking towards the foothills of Provo from the Ironton Overpass.